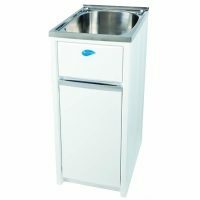 If you’re looking for a powerful laundry cabinet with no frills, then the Alpine PVC Double Sink Laundry Cabinet is just what you need. 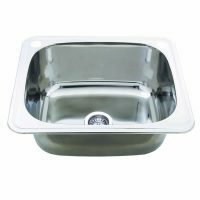 Featuring a simple, no-nonsense design, this large cabinet is equipped with two large 45L square sinks made out of grade 304 stainless steel. It is available in a glossy white finish and includes soft closing doors equipped with chrome handles. 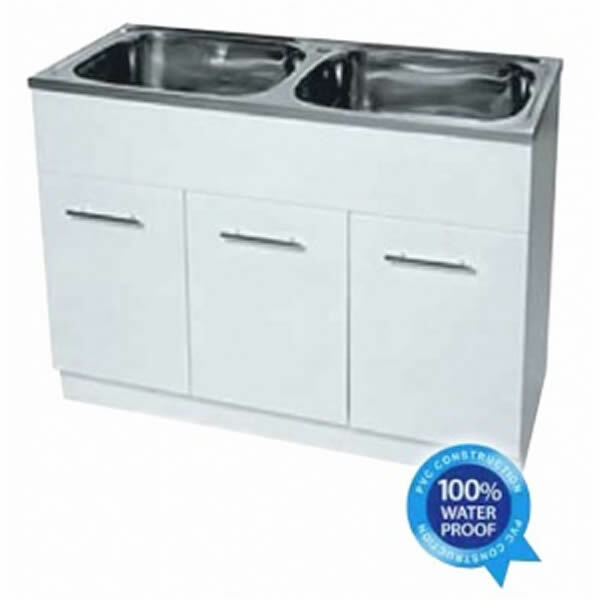 Manufactured using high quality PVC board, the PVC Double Sink Laundry Cabinet features a durable 2-pack painted surface, which makes it completely waterproof. This means there will be no water damage to the cabinet, even after years of usage. The cabinet measures 1160x895x500mm and is equipped with a single bypass assemble and a stainless steel waste. 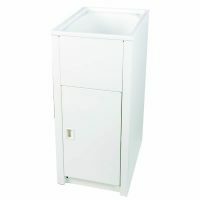 Alpine offers a solid 5-year warranty on this laundry cabinet, covering materials used and workmanship during manufacturing. As a top grade product, it will certainly offer you many years of usage. The PVC Double Sink Laundry Cabinet is one of our bestsellers here at Ross’s Discount Home Centre and is currently available at an unbelievable bargain. Don’t put off your purchase – buy this laundry cabinet today and ease your cleaning duties. No-nonsense design with two large 45 litre square bowls.